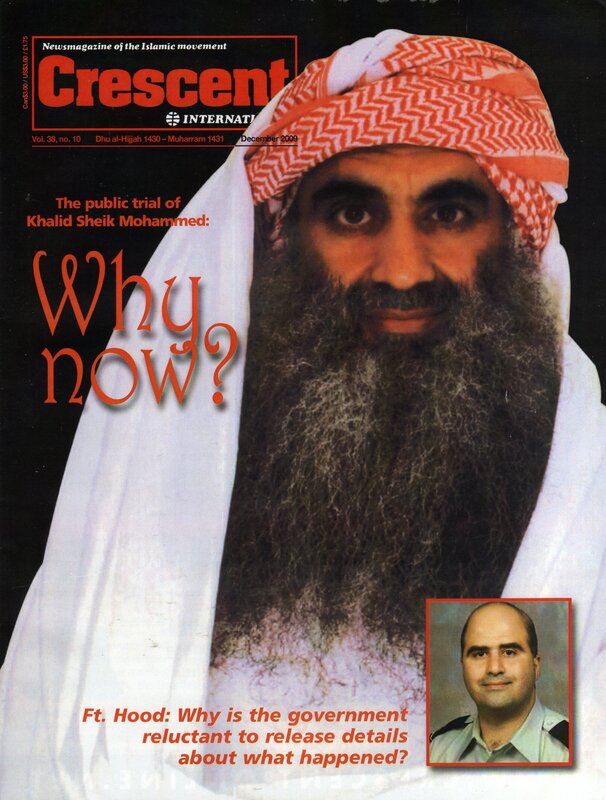 January’s Crescent International has the great range of articles we have come to expect from the “newsmagazine of the Islamic movement”. Headlines include: Impediments in the path of Muslim unity; String of Zionist-sponsored anti-Iran conferences; Iran protests: the view from Tehran; Switzerland uses a referendum to ban construction of minarets; Gaza: one year on; Chechnya war: 15 years on, and US pushing Pakistan into the abyss of oblivion. 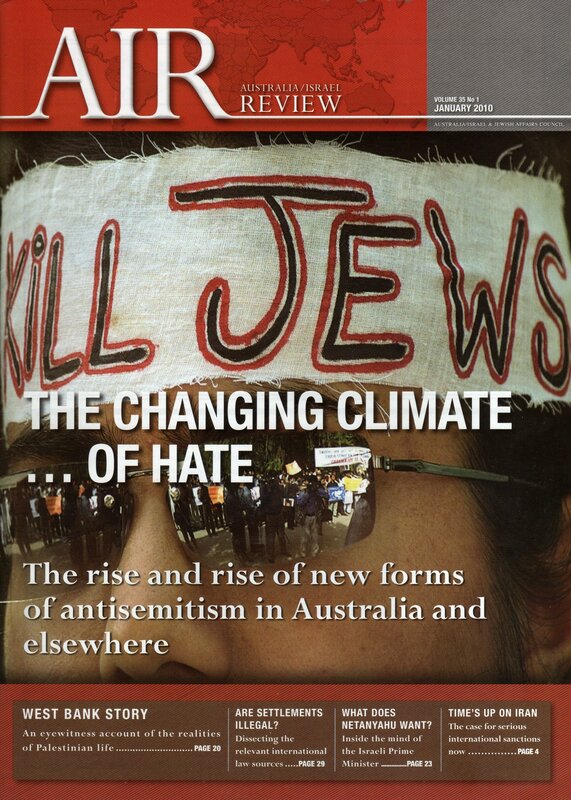 I posted an article from the January edition of Australia/Israel Review on December 31. In this entry, I would like to look at the magazine’s cover photograph, which shows a woman (?) wearing a headband with the words “Kill Jews” written on it. 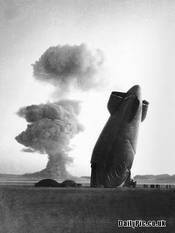 Is this a genuine photograph? Wouldn’t any demonstrator wearing such a headband be arrested and charged with threatening to kill? Do people who harbour such murderous sentiments/intentions show up at anti-Israel protests – which often include some Jews? Don’t they do their dirty work after dark? The use of this photograph, genuine or not, is a clear attempt to tar all critics of Israel with the anti-Semitic brush. 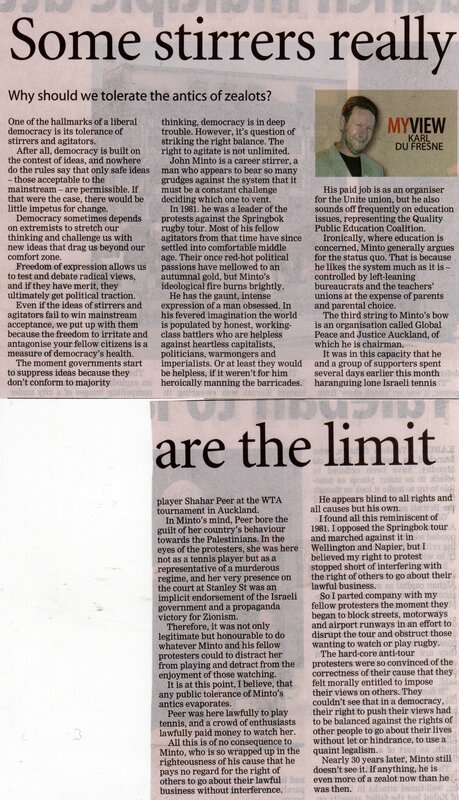 In this column by Karl du Fresne, from the Manawatu Standard of January 20, 2010, a voice from the Muldoon* imperium, which blighted New Zealand in the late 1970s and early 1980s, is raised again to rail against all those who would do more than politely demur at repressive policies of apartheid in other parts of the world. Even du Fresne’s use of the term “stirrer” is straight from the Muldoon lexicon. Heaven forbid that anyone with “grudges against the system” (the apartheid system?) should do anything to interfere with anyone’ else’s right to “lawfully play tennis” or pursue any other “lawful business” – including, one assumes, all the sporting, commercial and cultural business we once did with the white South African regime. It goes without saying that if everyone, both here and overseas, had adopted du Fresne’s position in the 1970s and 1980s, we would still be engaged in those fatuous “bridge-building” exercises, those “lessons by example”, that were to lead, at some time in the distant future, to a softening of the oppression in South Africa (but never, of course, to a radical change in the apartheid system, which was supposedly set in stone). Incidentally, before we start to feel too sorry for “lone Israeli tennis player” Shahar Peer, we should not forget that she happily served in the IDF – Israel’s vicious instrument of conquest and oppression in the Middle East. *Robert “Piggy” Muldoon was prime minister of New Zealand between 1975 and 1984. 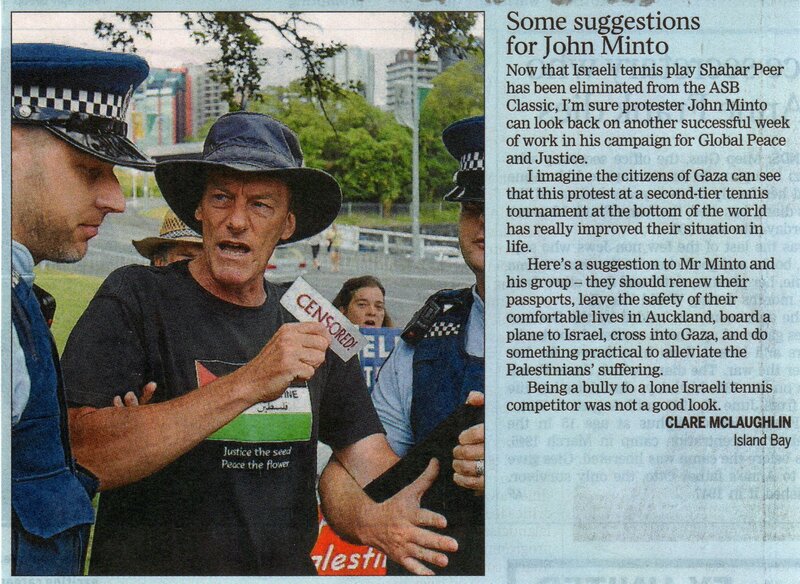 The above clipping is from The Dominion Post of January 13, 2010, which featured the letter. Virtually all the comments I have read in the New Zealand media have been in a similar vein. Some commentators acknowledge that Israel treats the Palestinians unjustly, but go on to ask, fatuously, “What about… (China, North Korea, etc. )?” – just as they did in the 1970s and 1980s when John Minto and others were campaigning against the apartheid regime in South Africa. At that time, the questions were “What about Biafra?” and “What about Idi Amin?” Needless to say, such commentators never protest about injustice/oppression in any part of the world at any time. All they want to do is sit in front of the telly and watch their favorite sport. From the New Zealand Herald of December 30, 2009. 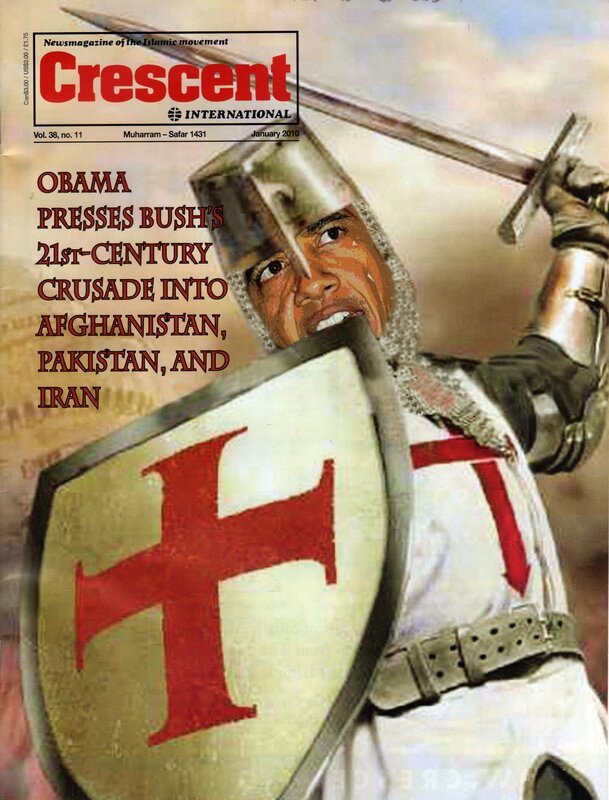 The December issue of Crescent International includes articles with such titles as “US policy driven by greed and hubris”, “Intensification of war on Muslims in the US”, “The imperialism of history and the colonisation of the Muslim mind”, “Fort Hood: the alternative narratives”, and “FBI death squads kill Imam Luqman Abdullah after two years of spying with agent-provocateurs”. As someone who was born and brought up in England, I was particularly interested in “Britain’s McCarthyite tactics against Muslims”. 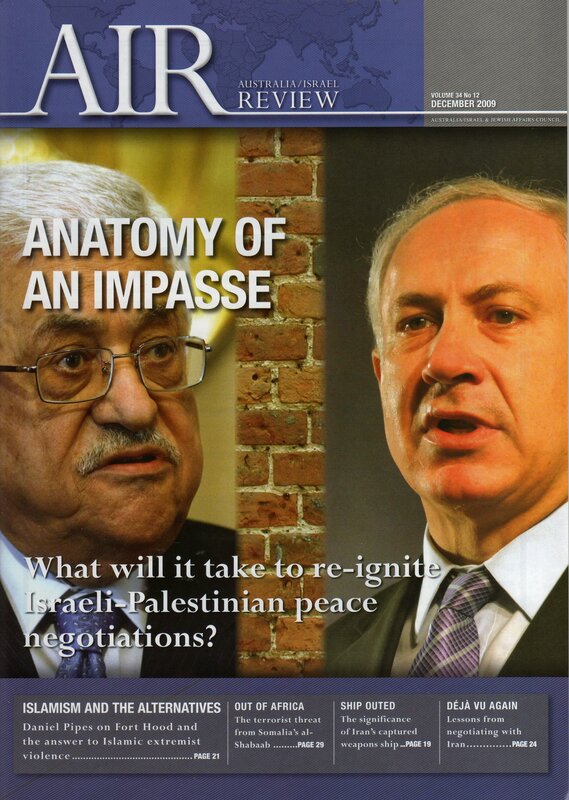 The cover of the December edition of Australia/Israel Review asks rhetorically, “What will it take to re-ignite Israeli-Palestine peace negotiations?” Obvious answer: The total capitulation of the Palestinians. Ultimately, the Zionists will not be satisfied with anything short of that.